As the popularity of low cost, low end antenna analysers increases, client software appears to enhance the capability of the analyser. The SARC-100 is one of these low end analysers, it and its many close derivatives are marketed under various model names. The sign of reactance discusses a major weakness of these and many other low end instruments in that they do not ‘measure’ the sign of reactance, displaying the magnitude of reactance and leaving it to the user to solve the sign problem. SM6WHY is one of the many who have produced software for the SARC-100 that purports to solve the sign of reactance problem. He gives this graphic on his website to demonstrate the capability of his software used with a SARC-100 (which does not sense the sign of reactance). Above is part of the graphic he offers. 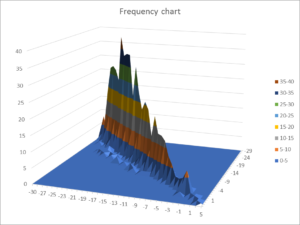 Though the image is poor quality, the VSWR plot appears smooth and quite typical of that which might be obtained by measuring an antenna system near its VSWR minimum. 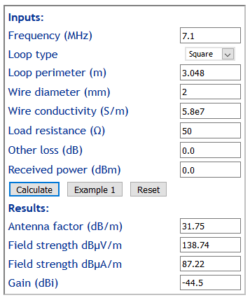 Shunt matching a loaded HF whip with just a VSWR meter gave a direct answer and supporting explanation to an online poster’s question about optimising an 80m loaded mobile vertical with shunt matching, specifically the inductor needed and an adjustment procedure. The original poster clearly had the impression that this improvement of the original VSWR=1.3 would make a large difference. The only other option for me is to remove the shunt and set my swr back to 1.3:1 and not be able to communicate. After 50 responses, none of the online experts have offered a direct answer or explanation. The coil inductance is too low, try a solenoid of 13 turns, 40mm diameter and 40mm length. G4JNT reported some measurements of WSPR reported SNR vs input signal at (Talbot 2010). 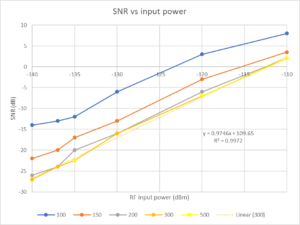 His experiment connected a WSPR modulated RF source directly to an SDR receiver, and he recorded WSPR’s receive SNR reports vs input attenuation and configured SDR receiver bandwidth. The direct connection means the test is not subject to normal radio path effects like fading. The table above is derived from Talbot’s, his information about the RF source (-30dBm) and attenuator settings are converted to receiver input power (dBm). Frank, W3LPL conducted two interesting experiments with WSPRlites on 20m from the US to Europe essentially. The first experiment was a calibration run if you like to explore the nature of simultaneous WSRP SNR reports for two transmitters using different call signs on slightly different frequencies simultaneously feeding approximately the same power to the same antenna. The second test uses a WSPRlite directly feeding the same stacked Yagis, and the second WSPRlite feeding nearly identical stacked Yagis that point directly through the other stack located four wavelengths directly in front. Power at each antenna was about 140 milliwatts for each WSPRlite. 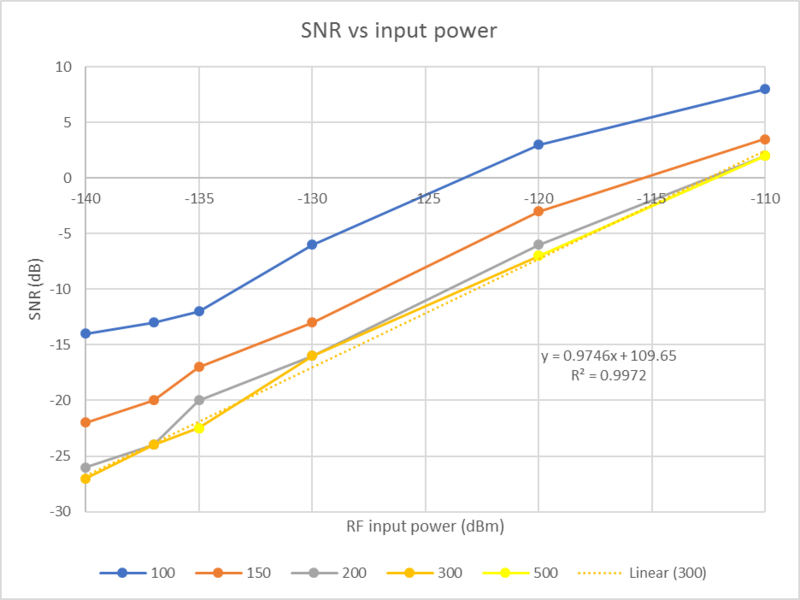 The data for the test interval was extracted from DXplorer, and the statistic of main interest is the paired SNR differences, these are the differences in a report from the same station of the two signals in the same measurement WSPR interval. There is an immediate temptation of compare the average difference, it is simple and quick. But, it is my experience that WSPR SNR data are not normally distributed and applying parametric statistics (ie statistical methods that depend on knowledge of the underlying distribution) is seriously flawed. We might expect that whilst the observed SNR varies up and down with fading etc, that the SNR measured due to one antenna relative to the other depends on their gain in the direction of the observer. Even though the two identical antennas point in the same direction for this test, the proximity of one antenna to the other is likely to affect their relative gain in different directions. 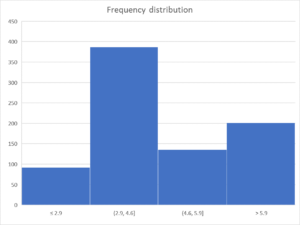 What of the distribution of the difference data? 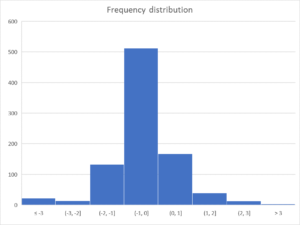 Above is a frequency histogram of the distribution about the mean (4.2). Each of the middle bars (0.675σ) should contain 25% of the 815 observations (204). It is clearly grossly asymmetric and is most unlikely to be normally distributed. A Shapiro-Wik test for normality gives a probability that it is normal p=4.3e-39. Frank, W3LPL conducted two interesting experiments with WSPRlites on 20m from the US to Europe essentially. This article discusses the first test. The first experiment was a calibration run if you like to explore the nature of simultaneous WSRP SNR reports for two transmitters using different call signs on slightly different frequencies (19Hz in this case) feeding approximately the same power to the same antenna. The first test uses two WSPRlites feeding the same antenna through a magic-T combiner producing a data set consisting of 900 pairs of SNR reports from Europe with only about 70 milliwatts from each WSPRlite at the antenna feed. We might expect that whilst the observed SNR varies up and down with fading etc, that the SNR measured due to one transmitter is approximately equal to that of the other, ie that the simultaneous difference observations should be close to zero in this scenario. Above is a frequency histogram of the distribution about the mean (0). 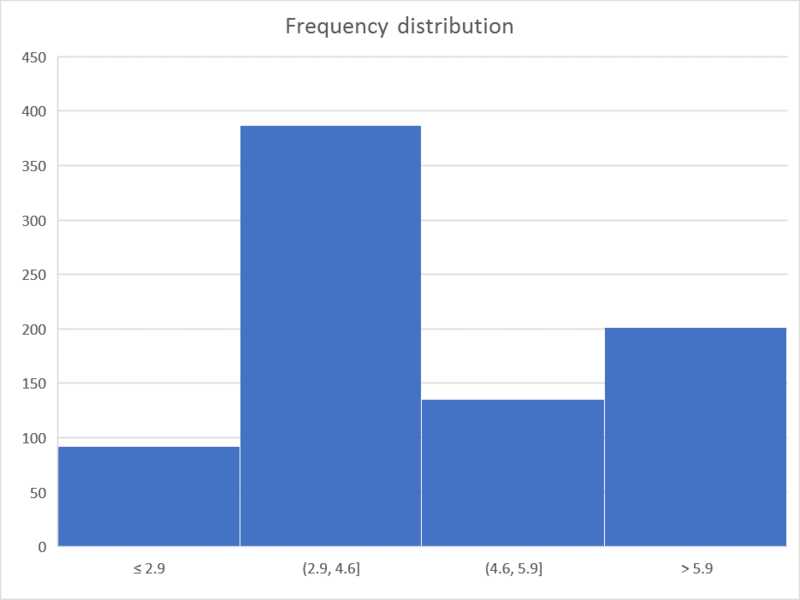 Interpretation is frustrated by the discrete nature of the SNR statistic (1dB steps), it is asymmetric and a Shapiro-Wik test for normality gives a probability that it is normal p=1.4e-43. So lets forget about parametric statistics based on normal distribution, means, standard deviation, Student’s t-test etc are unsound for making inferences because they depend on normality. Nevertheless, we might expect that there is a relationship between the SNR reports for both transmitters, We might expect that SNR_W3GRF=SNR_W3LPL. So, lets look at the data in a way that might expose such a relationship. Above is a 3D plot of the observations which shows the count of spots for each combination of SNR due to the two transmitters. The chart shows us that whilst there were more spots at low SNR, the SNRs from both are almost always almost the same. A small departure can be seen where a little ridge exists in front of the main data. Small untuned loop for receiving – is an amplifier necessary? 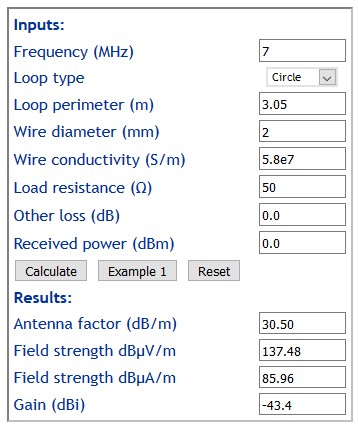 I have a 30″ square loop of #12 wire that I use for receiving, and when I attach it to the receiver on 40m, the audio output voltage goes up three times or more. Do I need an amplifiers, or will it worsen things? It is possible to determine the ambient noise temperature from the true noise power change over that of a matched termination. The equivalent noise temperature of the receiver is implied by its Noise Figure when it is terminated with a matched termination. Noise due to an open circuit or short circuit input is not defined. The correspondent re-measured with a termination, and as it turned out, the results were much the same, so lets work the case of voltage increasing by a factor of three. Without going any further, we can calculate the degradation in External S/N by the receiver, total noise power is proportional to (3^2) times internal noise, so S/N degradation is 10*log(9/(9-1))=0.51dB… very little. It is true that an amplifier is unlikely to improve things and will be likely to degrade things because of intermodulation distortion that is inherent in them, more so if it overloads on broadband signal input. But let’s go on to estimate the ambient noise figure Fa. It is really important for this process that the AGC does not change the receiver gain, and there is no overload or clipping. The latter means DO NOT SWITCH THE AGC OFF, the S meter deflects, you need extra input attenuation to keep things linear. Now lets assume the receiver has a Noise Figure of 6dB (most modern HF transceivers are in that ball park). 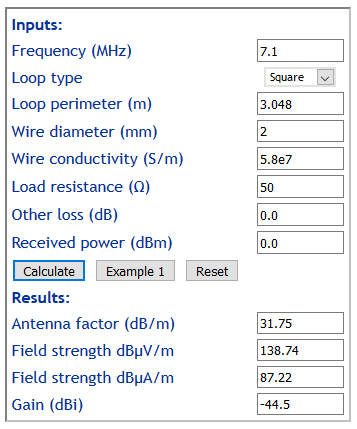 We need to estimate the gain of the antenna, we will use Calculate small loop Antenna Factor. Ok, terminated in 50Ω, the untuned small loop has a gain of -43.4dBi. So, it captures only a very small portion of the external noise, but even so it delivers sufficient to the receiver to increase the output voltage by a factor of 3. Continue reading Small untuned loop for receiving – is an amplifier necessary?